The best kind of business venture is one that requires minimal work to generate revenue. This is why there are certain business opportunities that are meant to be used as a way to generate passive income; you basically get the business or investment set up, and it will generate revenue without requiring a lot of work. A vending machine business is one of the most popular businesses in this category. With a good vending business, you can generate sales and earn income from your machines without manually operating them. Even better, many vending machine business opportunities are offered by companies who will supply and maintain the machines for you. Don’t get too excited just yet. 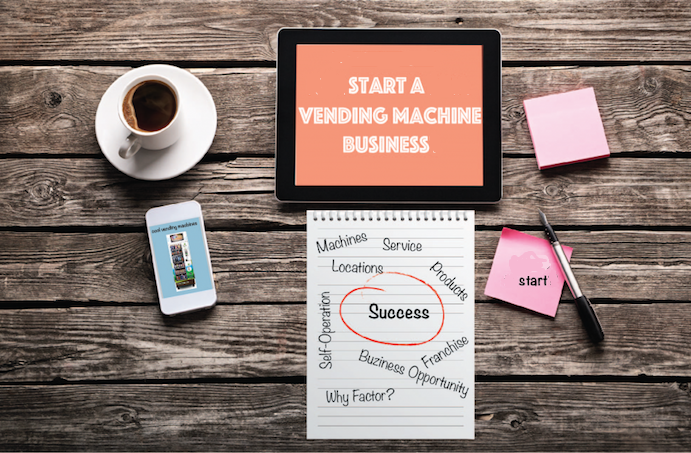 Before you start investing in vending business opportunities, here are the five important things you need to know about getting started. Most business owners investing in vending machines do so because they already own the location. This is why you find vending machines in privately owned businesses such as gyms and coworking spaces. It is also the easiest way to get started with this business since you don’t have to worry about the location and fees associated with it. However, you shouldn’t limit your vending business to only the locations you already own or manage. The biggest opportunities can be found in locations with a lot of foot traffic, including commercial office buildings, public spots, and parks. With some research, you can learn more about how you can place your vending machines in these potential locations. That one aspect – foot traffic – is crucial. The worst-case conversion rate is around 5%. You can use this number to calculate the potential return of a vending machine in a particular location based on the traffic that comes through that spot. Deciding whether to invest in the location is so much easier when you have this formula in mind. The second thing to note about starting a vending business is the importance of choosing the right products. There are products that act as a generally appealing item to a wider market. Items like drinks and snacks are quite popular no matter where you open the vending business. Fast-moving items are worth looking into as well. For long-term success, however, you want to find a set of products in a particular niche. This way, you can build your marketing campaign – and the entire business plan – around catering to a more specific market segment. It is also the reason why franchises like Healthy YOU Vending are incredibly successful and very sustainable. In the case of Healthy YOU Vending, the vending machines sell healthy snacks made from organic and healthy ingredients. The growing awareness for healthy eating certainly makes this vending business opportunity more interesting. You benefit from both the boom of the vending business and the sustainable growth of the health industry. Depending on the business opportunity you approach, you may be required to do different things to start and maintain the vending business. There are companies that offer maintenance and restocking as part of the business venture. There are also companies that sell vending machines for you to stock and maintain yourself. Your level of involvement affects two things: the convenience factor of running the vending business and your level of profit. When you do everything yourself, you can expect a bigger margin from the business. That said, you will end up spending more time – and energy – towards keeping the vending business running. Opting for convenience, on the other hand, is the more balanced approach. Since you only need to spend around 5-6 hours a week to keep the vending business running smoothly, you can have multiple machines and invest in several income streams while still having plenty of time to do other things. With a vending business, you always want to start small. Rather than investing in several machines all at once, it is much better to enter the market with one or two machines. A lower starting point allows you to get into the vending business while limiting your risks. You can also learn a lot from the insights generated by your first machines before investing in more locations. Once the business is rolling, you can decide to scale up and cover more locations at any time. That’s the beauty of running a vending business; a new machine can be set up and stocked in a matter of hours. The approach also comes with an added benefit: you’ll have more time to search for better, more potential locations. Scaling up is good for your bottom line. You can keep your return on investment (ROI) high by limiting the investment you make and maximizing the return on those investments. Since this business is easy to master, you’ll start scouting new locations and discovering more opportunities in no time. Lastly, consider diversifying your vending machine business by adding more machines as well as more products. In select locations, you can have two vending machines side by side, with each machine offering a set of products that complement the other. Since both machines belong to you, you are basically doubling your profit from the location. For example, you can set a drinks vending machine next to a machine with healthy snacks. Customers who buy the snacks are more likely to get bottled water or other healthy drinks as well, so the two product categories complement each other. Setting up two machines in one location also doubles your ability to learn about the customers. Diversifying is a great way to manage your cost. It also gives you more options when it comes to optimizing your machines for maximum sales since you are no longer limited to only one product category. As long as you take the time to learn about your target customers, you will be able to provide the products they want every time. Now you are looking at a vending business with a huge chance of success. Before you get to that point, use the tips and tricks we discussed in this article to get started with your own vending machine business. What Are The Best Hobbies To Turn Into Lucrative Businesses?